Tun up fi hear and see how we’re all part of That Mosaic Riddim within The Universal Sounds Making Life Music on countless levels spinning all around us. Tun Up, nuh?! Yes, one can read so many things, from scriptures to the Beatles, to discover something transcendental within music…, but with reggae, one only needs to let go into the riddim to feel that shift in Consciousness. Nuh joke. It’s from this conscious level/groove MR songs strive to inspire the Collective Thought, to promote Potential in The Oneness we all share through Music. We each witness, feel, and Live, our own Growth via the natural Freedom&amp;Joy within Creating and Connecting to musical expressions, daily. Looking closely: we can see the same as the phenomenon of lightning reaching up from the earth to merge with that dancing downward through the sky, all Music Connects —with, and where …and to what degree, varies; still, Music Flows through Everyone. It is time to Wake Up To That Feeling and let go of the fear-based mentality, which can only culminate in the end as greed within oneself, beginning with a desire for more than one needs. Nothing is more valuable than your Connection To Source Energy, and Nothing Is More Fulfilling – One Love. Realize fear is far from Grace/Love, The Source from which All Life Comes Into Existence. Unless you think greed has given Life To All Things, Freely, and Unconditionally? No. We know this is not greed’s MO. Look closer: see we were all planted here with Roots Ina We Soul to Nourish From The Source Of The One Love. Mosaic Riddim’s band mission is to make minds think and bodies dance, hard, on both accounts; and yes, at the same time – or at the very least within the same night. And so far so good, we’re being told – thank you. We perform original reggae and calypso songs inspired by the innate unity within society, and the conscious discourse that flows out as norms. That said we feel it important our music resonates from a sincere place/platform while we’re sharing. And it is from this perspective, I have to confess, it’s been the most challenging with forming and maintaining a reggae band, before even thinking about writing songs and performing live. Don’t get me wrong, as the band leader, I’ve had the best musical experiences in my Life, thus far …and we’ve only just begun. However, if you’re looking for a little saucy expose, let me tell you, it’s not easy making reggae music in BC, Canada. Still, the same as making honey in Turkey, Rye in Saskatchewan, or friends at a Klan rally; it may not easy, however, the results are worth the effort. Ur attention please: Due to band memoire copyright laws the following content cannot be shown on this site. …and so, that’s how Mosaic Riddim managed to work through four transitions, two drunken bouts, and 25 bandmates leading to our MR team today. Still I cannot/ will not knock any of these musicians as they each brought talent to the table, truly. And Thankfully, through no control of my own, quite honestly, the band has grown in sound and production value – notably – with every step forward – Thank Goodness. However, from all this, it is most clear (to me), a band is no different from any relationship…and it can only be fun/fair if/once everyone/everyone is enjoying themselves. This can only happen when trust exists among all members, with being free to express fully. To begin with, before adding personality quirks (and booze in some cases)… imagine a room filled with musicians, with everyone’s creativity surfacing rapidly, constantly – for hours – as the music is coming out and being shaped and crafted from all directions. Imho there is no better way to express with others in Life. It’s like everyone gets a chance to mould and shape the (original) music at the same time. The synergy within sharing music is immeasurable, as palpable. Think drum circle, or better yet, go to a drum circle to find/experience this Synergy for yourself. This can even exist between the dancer and the drummer in terms of self expressions in seeing and hearing the visual auditory synergy. It feels even more amazing in creating, than it is to watch, and I am certain the dancers feel the same. You just gotta Love The Riddim of The Music! Yes, this started as an expose on MR’s debut challenges; however I would not change a thing seeing all are Life lessons within the privilege of meeting and working with some remarkable players, and real musicians. I am most grateful for this Gift we share, even more now as it feels we have the right band camaraderie (and respect) among members to move forward as One; playing music about Love and Unity. Our most recent band kudos came from a random bloke, downtown Vancouver; he recognized us soon after our concert at Trinidad and Tobago north Vancouver festival. He said, “Hey man, you guys are really good…and I really like that you guys do originals, it’s something new…” There is nothing a lyricist likes to hear more, aside from maybe, “Your bill was paid for by that table.” Regardless, to that concert goer, thank you (again) for taking the time. MR has a ways to go still in manifesting the simple idea of making Good Good reggae music in North America, but so far we know we are truly Blessed considering the wonderful opportunities given, including performing BC’s biggest and best Caribbean event, Caribbean Days Festival, in 2017; this, after playing some of Vancouver’s more established and recognizable venues like the Roxy and Calabash Bistro within our first year. Thank you. All said we are especially grateful to be able to offer something new in the realm of reggae; so come catch a groove pan we riddim! 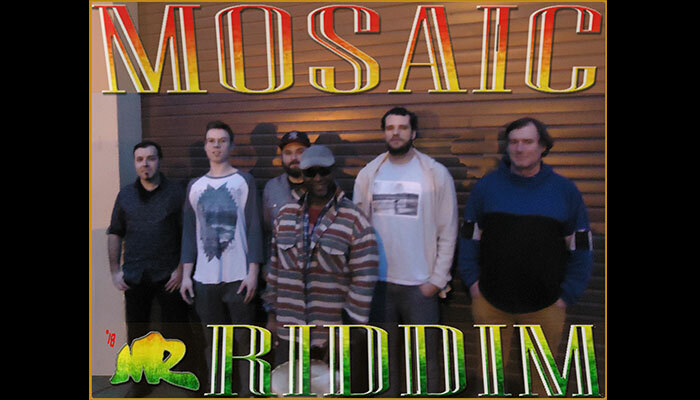 Follow Mosaic Riddim Facebook Page to see concert dates. THIECKO Releases New Album "Stand Tall"